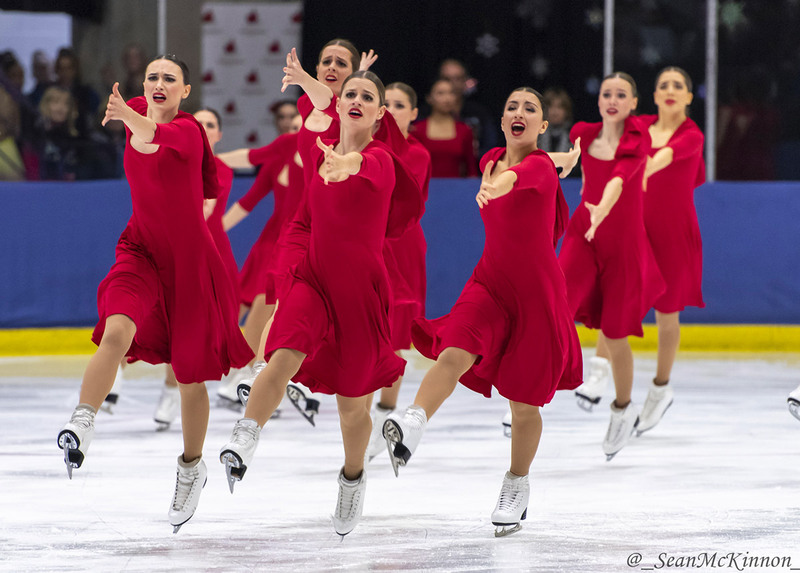 Nexxice, Burlington Canada, retained their lead coming first and wowed the crowd with their free programme set to the Handmaiden’s Tale. Complete with red hoods, they completed an atmospheric piece although there was a fall in the intersection. They received 133.18 points and 216.74 in total. In second place was Crystallettes from Dearborn USA, earning 118.16 point. Skating to Maleficent, they had various skaters highlighted using subtle changes in their costumes. It was a strong performance and very effective although they suffered a fall in the Moves element. They scored 186.22 points altogether. In third was Icicles Senior from Nottingham GB who skated to the Lion King. They scored 76.84 with a fast paced programme although they did have one fall. They scored 115.74 points together. In 4th was Wight Jewels, Isle of Wight GB, who fought hard to move up a place with their bright carnival programme scoring 64.89 points. They scored 93.71 in total. Falling to 5th was Zariba from Aberdeen GB who skated to Moulin Rouge. They earned 59.14 points with a total score of 89.77. In 6th place was Ice United from Den Bosch, Netherlands. They scored 56.10 points and a total score of 83.40 points. There was no chance in the standings with Team Berlin Junior, Germany, keeping their lead and coming first with 74.93. Skating an Aladdin inspired programme, they scored 122.8 points in total. 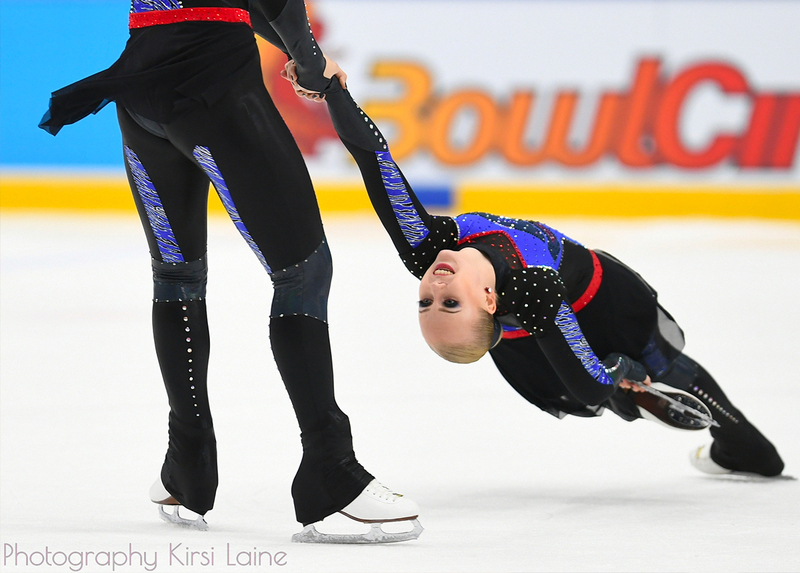 In second place with 63.86 points was Icicles Junior, GB, skating to the Greatest Showman. They had a total score of 104.01 points. This team will be representing GB at the World Junior Synchronised Skating Championships this year. It was a close match in this category with two teams competing from the same clubs as in the Junior Category. Team Berlin Novice, Germany, came first with 52.36 to a balletic programme. Ice Dreams, GB, came second with a Cinderella programme scoring 50.21 points. Solway Stars from Dumfries, GB, shone in this category with two beautiful routines scoring 97.93 altogether. They earned 34.64 in their short with a fall in the No Hold Element. Their long was skated to Moana, scoring 63.29 points. In second place with a total score of 88.10 points was Le Soleil from Mks Axel. They scored 31.62 points in the short and 56.48 points in the long however they suffered a fall in the artistic line. In third place with 77.70 points was Whizz Kids, Altringham, GB. They came fourth in the short with 27.58 points but fought to pull themselves up the places in the long, scoring 50.12 points even with a fall in the Moves element. In 4th place with a total score of 76.92 was Unum, Sheffield GB. They scored 27.87 in the short with a fall in the no hold element and the 49.05 points in the long with their programme to Dance Macabre. There were two teams in this category. In first place was Ice Stars from Nottingham who scored 32.34 points. In second place was Wight Sparkles from Isle of Wight scoring 23.21 points. Both teams showed an improvement from the British Championships! 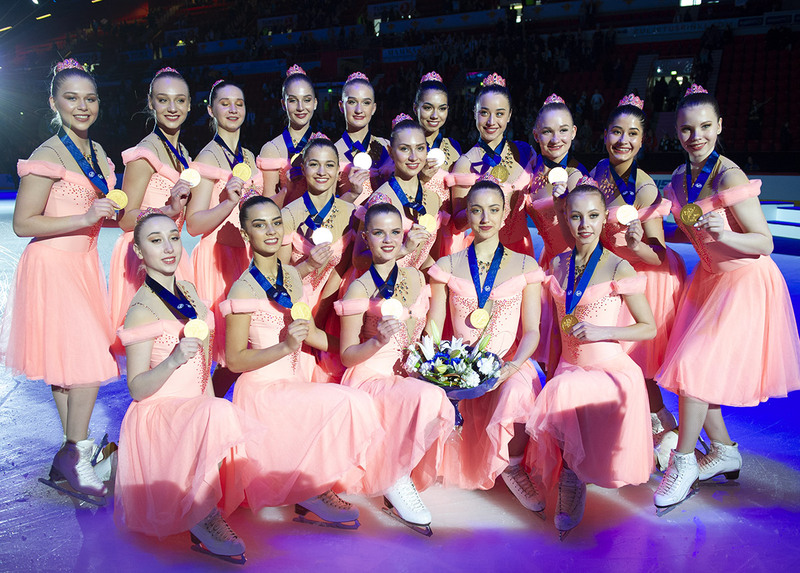 In first place was Ice Gems from Nottingham, scoring 27.38 points-the exact same score as they received at the British Championships. In second place was Topaz from Aberdeen, scoring 21.64 points and in third place was new team Magenta Juvenile from Cardiff who scored 16.50 points. There were 7 teams in this category. In a shake up from Nationals, first place went to Solway Comets from Dumfries scoring 21.44 points. In second place skating to Baby Shark, was Ice Pops from Nottingham, scoring 19.90 points. Third place was Novus from Sheffield scoring 15.18 points. In a category consisting of 6 teams, In first place was Solway Lightning from Dumfries, scoring 37.25 points. In second place was Deelites from Deeside who scored 31.76 points. Third place was earned by Shooting Stars from Gosport who scored 28.38 points. This category had 7 teams competing in it. In first place was Solway Eclipse from Dumfries. Skating a very smooth programme, they scored 40.51 points. Second place went to Ice Unite from Nottingham who scored 36.91 points. In third place was Gosport Allstars who scored 32.29 points. Finally was the adult competition with 7 teams competing from across the UK. The fight for a podium place is fierce in this category and its impossibly to predict who will place where. In first place was Starlight Rain from Stirling scoring 29.00 points. In second place was Northern Stars from Hull who scored 23.15 points and hot on their heels in third place was Bladerunners from Altrincham who scored 23.09 points. The next British competition will be held in Sheffield at the Steel City Trophy 8th/9th March.